The launch trailer for the upcoming Hitman is upon us, but don't get too excited: just a portion of what you see will be playable when it releases on March 11. 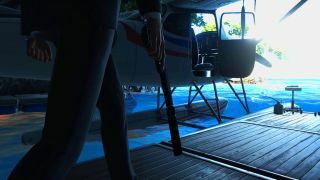 While the trailer features massive sandbox renditions of Paris, Sapienza and Marrakesh for Agent 47 to pursue his contracts in, only Paris will be available on launch day. Originally, all three levels were going to be packaged into an "Intro Pack" supplemented with additional levels and other content over the course of the year. However, developer Io-Interactive announced earlier this year that Hitman would go fully episodic, drip-feeding levels one at a time. Thankfully, the Sapienze and Marrakesh content will become available shortly after launch, with more levels set in Japan, Thailand, and the US to land in the latter part of 2016, when the game's first season ends. While the trailer could be misleading to those who haven't read the fine print, there are no gripes about the stylish use of the song "Men Today" by HEALTH, who have previously lent tracks to other games like Grand Theft Auto V and Max Payne 3.